I adore Jack London State Park -- the trails leading up to the high slopes of Sonoma Mountain are gorgeous. But. It takes me a loooong time to drive to this wine country state park, and I don't always want to hike 11 miles with 1500 feet of elevation change. 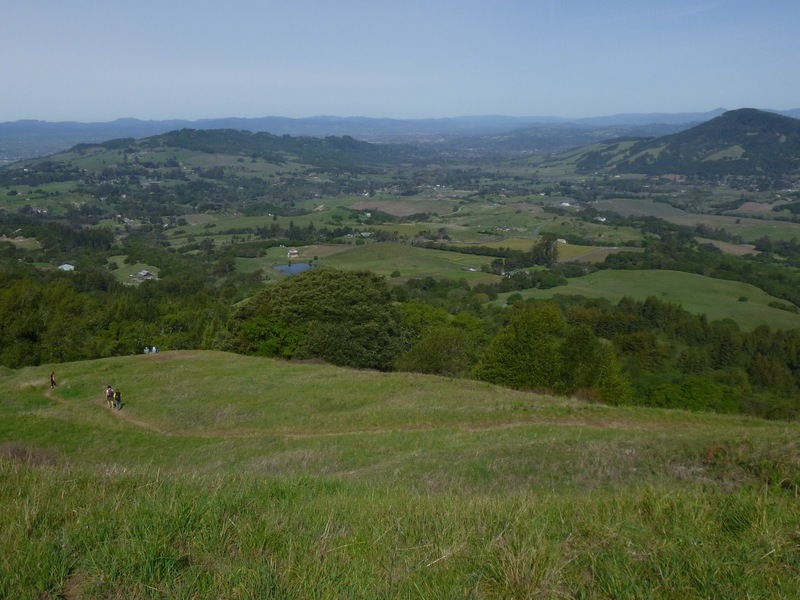 So I am thrilled that there is now another option to explore this special area: North Sonoma Mountain Regional Park. The park, managed by Sonoma County, is accessed from the west, via US101 and a series of charming and narrow country lanes. The trailhead elevation lingers around 1050 feet (400 feet higher than Jack London) and for now there are just two out and back trails. Umbrella Tree Trail is less than a mile and a good choice for beginners. 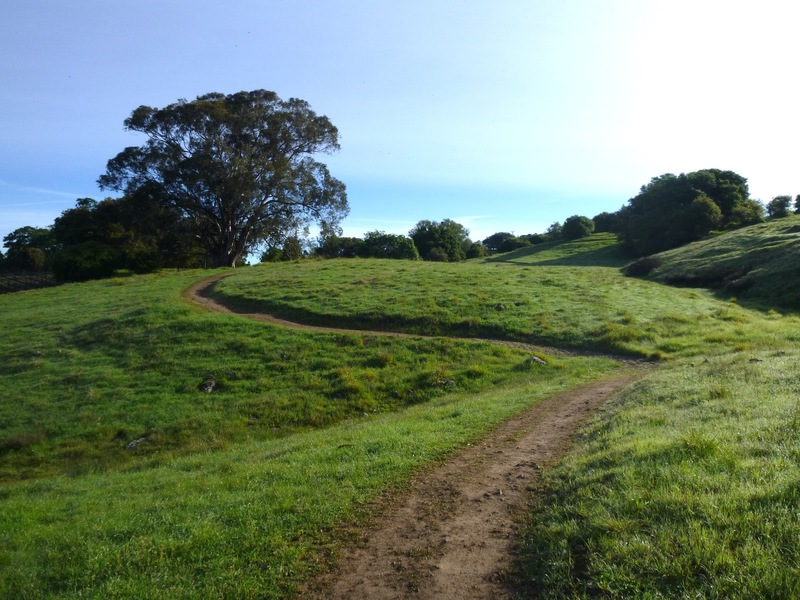 The real draw here is North Sonoma Mountain Ridge Trail. This narrow path climbs through woods and grassland to Bennett Valley Overlook, where views north are unexpected and gorgeous. Hardy hikers can continue on past the overlook into Jack London State Park, where bragging rights can be earned with a climb to the state park summit, at 2370 feet. This option demands over 1200 feet in elevation change and is about 10 miles round trip. For my first hike here, I chose the overlook as my goal. The park's trailhead is pleasant and roomy, with a new vault toilet and an information signboard (but oddly, no paper maps -- print one out before you leave hone). North Sonoma Mountain Ridge Trail begins at the edge of California bay woods, and their spicy smell always gets me in the mood to hike. After a brief and gentle descent, the trail reaches a redwood grove with picnic tables. Stay to the left as Umbrella Tree Trail heads uphill to the right here. 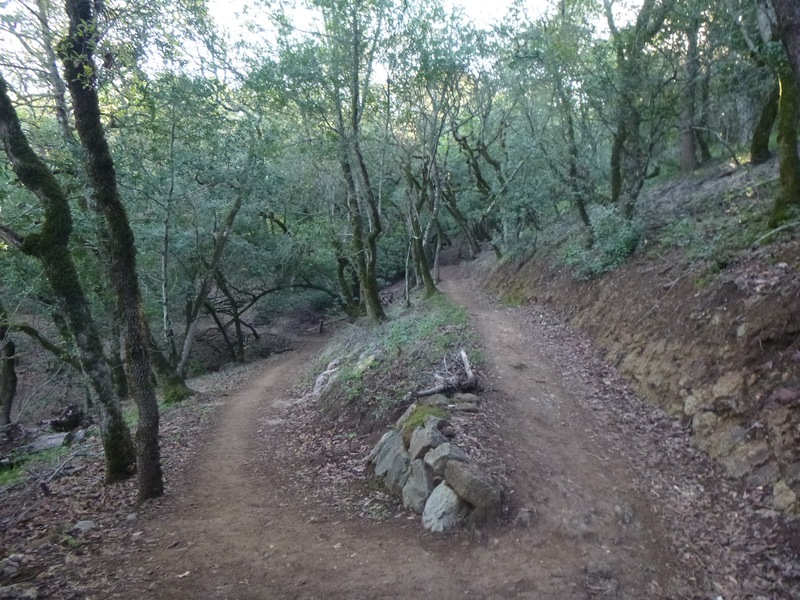 Sonoma Mountain Ridge Trail crosses the south fork of Matanzas Creek on a sturdy bridge and ascends slightly. Look for iris blooming here in late winter. Soon, the trail steps out into grassland. On my March hike, wildflowers were abundant, including blue-eyed grass, bluedicks, buttercups, and shooting stars. A huge eucalyptus tree anchors the property boundary on the left. At an easy grade, the trail winds through lumpy grassland dotted with a few small vernal pools. A sharp bend right orients the route uphill along the edge of woods where black and white oaks are mixed through bays. After one sunny stretch, the trail steps back into the shade and the climb begins in earnest, via a long series of switchbacks through woods of buckeye, madrone, bay, and oak. Loads of flowers here in late winter, including milkmaids, hound's tongue, mission bells, woodland star, and red larkspur. With most of the ascending done, the trail cuts across grassy slopes and pockets of trees, before reaching a junction at 1.9 miles. Sonoma Mountain Ridge Trail continues straight, passing under high tension power lines on the way to Jack London State Park. The overlook path makes a sharp right. After a short ascent, the hillside pauses at a level shelf -- this is the overlook! No benches or signs. A rougher path continues uphill, and just before a locked gate, scrambles up to a higher grassy knoll. I shared this scenic spot with wandering swallowtail butterflies, which were sampling flowers sprawled throughout the grass. The view was surprising -- Annadel State Park rises up gently from Bennett Valley and Sugarloaf Ridge and Hood Mountain comprise a giant wedge ascending from Napa Valley. Mount St. Helena looms off to the northeast. As I lounged and soaked in the beauty, I heard turkeys chortling somewhere downhill. Eventually, I dragged myself up and headed back down to the trailhead. What a fantastic hike -- well done trail planners and builders! The trailhead access road is very narrow -- drive slowly. Dogs are not permitted on the trail (map says "at this time," so maybe they will be allowed in the future. The official map shows the segment from the trailhead to the overlook as 1.9 miles. It felt closer to 2.5 to me. Next time I'll remember to bring my GPS. Elevation change is about 800 feet, but the trails are well-graded. $7 parking fee (self register at iron ranger). Link to the official park page (BAHiker write up coming soon). View more photos on the BAHiker Facebook page. My name is Miles. I went through a couple of posts, pretty awesome blog you have going here. I use to have my own, but found myself having more fun looking at others than doing my own. Anyway, I'm contacting you to see if you would be willing to look at my blogging tool I made. I moonlight as a programmer and decided to make a map plugin tool that I always wanted for my blog. Essentially, it allows only the map owner to pin their blog posts to it. I also thought it would be fun to have a 'visitor map', so blog followers could sign it and create a geographic guest book of sorts. I have been a fan of BAHiker since the beginning. It is the only website a recommend to friends and strangers. As I wrote to you on a personal email a few years ago, your website inspired me and my retired over weight and under exercised friends to hit the trails together, building up distance and elevation gain. We are between the ages of 67 and 72. Each year we set a special distant location as a goal and work toward it locally. Last year it was a high sierra camp. This summer it is Sperry Chalet in Glacier National Park. That is a 7 mile 3000 foot climb. It seemed perhaps not possible a couple months ago, but the demands of local hikes like PG&E trail at Rancho San Antonio, Cupertino (8-9 miles with 4000 ft + incline) and Wild Berry Loop in Big Basin @ 10 miles and 2200 ft elevation change have given us confidence. I missed your postings and am glad to see you are engaged with the site again. Barbara, thanks for the nice note! سلام دوستان عزیزم،عروسی من دوهفته پیش بود و از تمامی خدمات و تشریفاتم کاملا راضی بود چون همه چی عالی بود و حرف نداشت، ی مجموعه بزرگی به نام پارسایا همه خدمات عروسیم رو دست گرفتن و بهترین آرایشگاه عروس، تالار عروسی، باغ عروسی و کارت عروسی و لباس عروس و ماشین عروس رو داشتم و ازشون خیلییی خیلییییی تشکر میکنم بابت این همه توجه و اهمیت.